Keith Curle has warned his players to be on their mettle on Saturday as they square up to a Morecambe team that he believes relishes being the underdog. The Shrimps are arguably the smallest club in Sky Bet League Two. They have the lowest average Football League attendance of just 1,904 - nearly 3,500 fewer than the Cobblers - and are also reported to operate on one of the smallest budgets. Despite this they have managed to maintain their Football League status since winning promotion from what was then the Conference in 2007. Current boss Jim Bentley has been at the helm since taking over from Sammy McIlroy in 2011, and although under him the north west coast side have regularly flirted with the drop back to non-League, they have so far kept their heads above water while bigger clubs have dropped through the trap door. Morecambe are once again enduring a season of struggle though, and arrive at the PTS Academy Stadium on Saturday just one place and one point above the relegation zone, having won just one of their past 11 league games. The Cobblers are hardly in fantastic form themselves, but Curle knows it will be anticipated that his team will be too strong for the visitors this weekend, and he says that is exactly how the Shrimps like it. 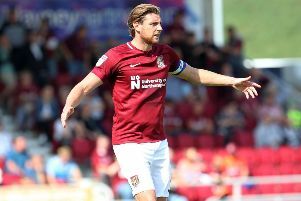 “I think the biggest strength that Morecambe have got, is that everybody expects you to beat them,” said the Cobblers boss. “They use that to their advantage, because if you are not on your game they will cause you problems. Curle is a big admirer of the job Bentley has done at the Globe Arena, and admits that by now he would have thought that another club would have come calling for his services. “I know the manager, I know him very well, and he is somebody I have a lot of time for and a lot of respect for,” said the Town boss, who has locked horns with the Liverpudlian several times over the years. “He was an apprentice at Manchester City when I was there and has done an excellent job at Morecambe. Morecambe currently sit in 22nd place in league two, one point above second-from-bottom Macclesfield and five adrift of 16th-placed Cobblers. They have already beaten Town this season, winning the reverse fixture back in August 1-0.